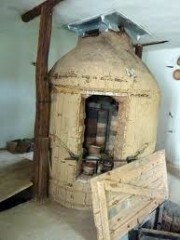 For centuries Busintsi village is famous for its pottery. During the Renaissance, Businci school reached its zenith, and in almost every house in the village were hanging pottery wheels. The first school of ceramics in Bulgaria is in Busentsi. In the center of the village is the ethnographic museum businskaa ceramics. It is a complex opened in 1982. The complex has a modern architecture and includes Businci Museum collection of ceramics exhibition and museum halls, along with workshops. There is a small hotel where the meetings are held of artisans and artists, national and international workshops. Development of unique Businci pottery tradition to contemporary art by artists-ceramists. In two rooms is located ethnographic exhibition. There you can see over 200 original exhibits from the traditional pottery Businci that creation of the old masters. Along with this there are modern ceramics in the typical spirit of Businci tradition of contemporary artists. Not accidentally, the village is a center of pottery, which is one of the oldest in Bulgaria. Businci famous ceramic school was established in the village Busintsi. Its origins are lost in time and works and no doubt considered the traditions of the Bulgarian pottery School of the Ages.